Medication error accounts for 1.3 million injuries each year in the United States. [/x_text][x_text]Knowing and remembering the “five rights” of medications will help prevent mistakes with medications. Medication error due to the wrong drug, the wrong dose, the wrong timing of administration, or the wrong route of administration accounts for 1.3 million injuries each year in the United States, according to the Food and Drug Administration (FDA, 2009). 1. The right person. Always check the bottle label to make sure it the correct person, especially in homes with multiple family members, each taking multiple drugs. 2. The right medication. Check the expiration date and the name of the medication. 3. The right time. 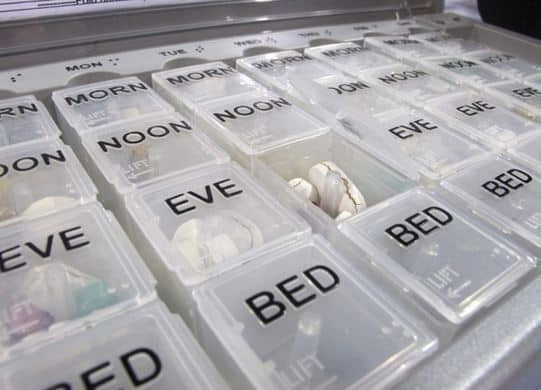 The label will list what time and how often the medication should be taken. Some medications need to reach a consistent level in your bloodstream in order to be effective. This means that your medications need to be administered at the right times to keep that level of drug in your system. 4. The right route. Medications may be taken a number of ways including orally (by mouth), inhaled, topically (applied to the skin), transdermal (skin patch) or sublingually (under the tongue). Follow the instructions on the medication containers. 5. The right amount. Read the label for the number of pills or tablets to take. The antibiotics could be less effective if you do not space them apart. And drugs that have a sedative or calming effect should never be mixed with alcohol. Adverse effects may include overdose of the drug, allergic reactions to the drug, and drug interactions between multiple drugs. Common side effects include dizziness, drowsiness, headache, nausea and vomiting, or confusion. You must tell your healthcare provider about any other medications you may be taking, or any times you’ve had an allergy to drugs or foods. © 2015 Paula Birney, Arista Home Care Solutions.